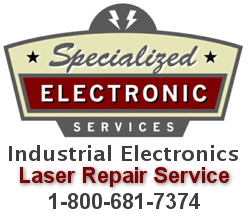 Laser Repair by Specialized Electronic Services Laser Technicians has 35 Years of Professional Laser System Service, Support, Sales and Expert Repairs. SES Laser Repair Service supports Industry Legends ESI Laser, GSI Laser, Lee Laser, Teradyne Laser, JDSU Laser as well as Robotic Industry leaders Kensington, Brooks Automation and many others. SES Laser Repair only uses OEM parts on all our laser repairs. SES Laser Repair do ON SITE Laser Repairs and Laser Repair Service. SES Laser Repair returns your laser to OEM specifications. SES Laser Repair has the most competitive pricing. SES Laser Repair has the best warranty in the industry. The Laser Technicians of SES employ Advanced Laser Troubleshooting methods for Laser Repair Service, Laser Part Repair and provides tailored Laser Training Courses in Predictive and Preventive Maintenance. SES Provides On Site Predictive and Preventative Maintenance. Our Experienced Laser Technicians and Engineers are qualified in multiple industries such as Link Processing, Active Trimming, Thick and Thin Film Trimming, Circuit Fine Tuning, Laser ID / OCR Scribing, CO2 Laser. We use the latest technology to test equipment to repair, service and final test your repaired parts.